And here’s what I came up with! I just had to use some of the products from the new March release for this card! They’re so dang cute. I started the card by using the cloud die from the Interactive Swing die set to ink blend some clouds in the background. I used Milled Lavender for this and splattered some white paint and Milled Lavender watered down over the panel. Once that was dried I heat embossed a sentiment from the Anything But Basic stamp set across the middle of the card. I love the sentiments in this set! They are so fun and sassy. 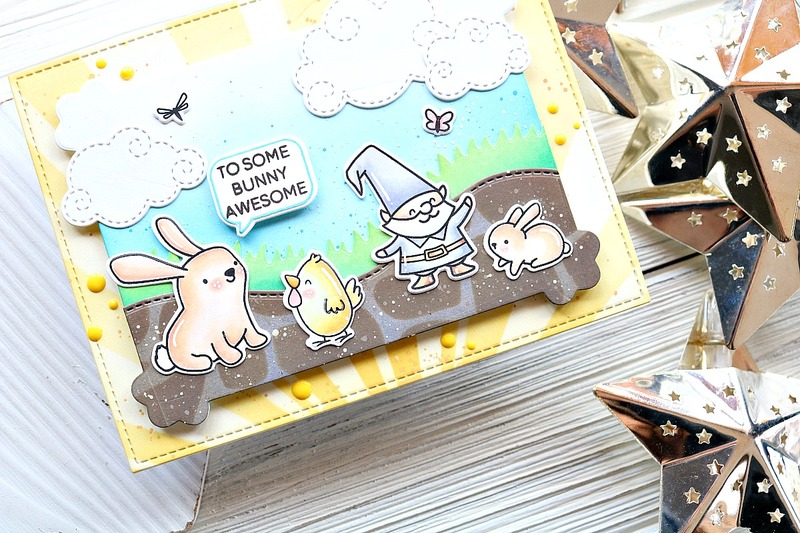 Next I stamped out some of the images from the new Cute Critters stamp set. I colored them in with my Copic markers and die cut them out. I used foam tape to adhere them to the cloud panel I had created so complete the sketch. Easy and adorable! How cute are those critters?! I just love them. And I think someone will love getting this encouraging card. Be sure to head over to the MFT challenge blog and see all the awesome inspiration! Plus, if you haven’t yet, be sure to check out the new release! It’s so stinkin’ cute and full of springy products. Thanks so much for stopping by today! I’ll see you again soon with another card! I’ve Got Somefin to Say! 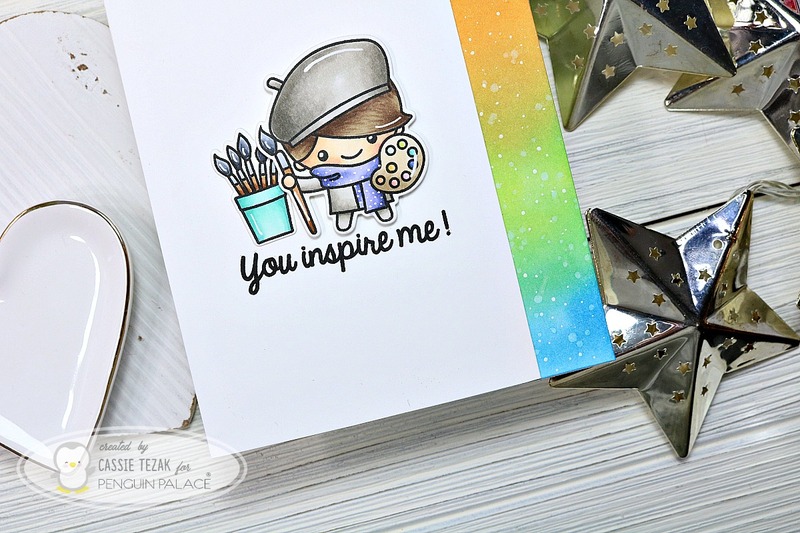 Today I’m sharing a circle card featuring ink blending and Copic coloring! Hi, everyone! It’s Cassie here, and I’m back to share another card with you today. 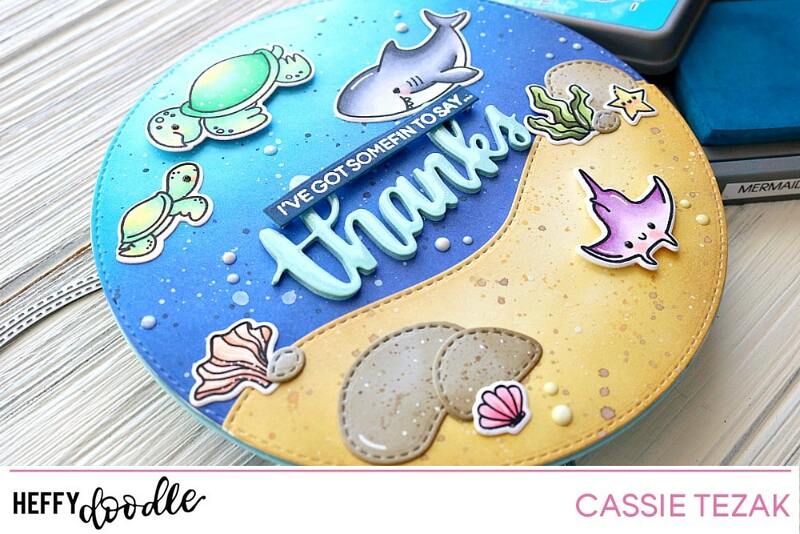 Ever since I saw Sindhu’s cute circle shaped card waaaaayyyy back when the last release first came out, I knew I had to try making a circle scene card. I’m so happy with how it turned out. I started by die cutting the largest circle from the Stitched Circle die set from a piece of 110 lb white card stock. This would become the background for my card. I die cut another of the largest circles, and this time used one of the Slopey Joes dies to create a hilly portion that would become the sand. Both of these pieces were colored using ink blending tools. The blue portion was made using Chipped Sapphire, Blueprint Sketch and Mermaid Lagoon. The sand was made using Antique Linen, Fossilized Amber and Frayed Burlap. I did splatters on both of the pieces in some of the colors I mentioned, as well as with a white opaque paint. I love to splatter things up, and it added the perfect texture for this card! I also die cut some of the Stitched Stones dies and added some ink and splatter to them as well. 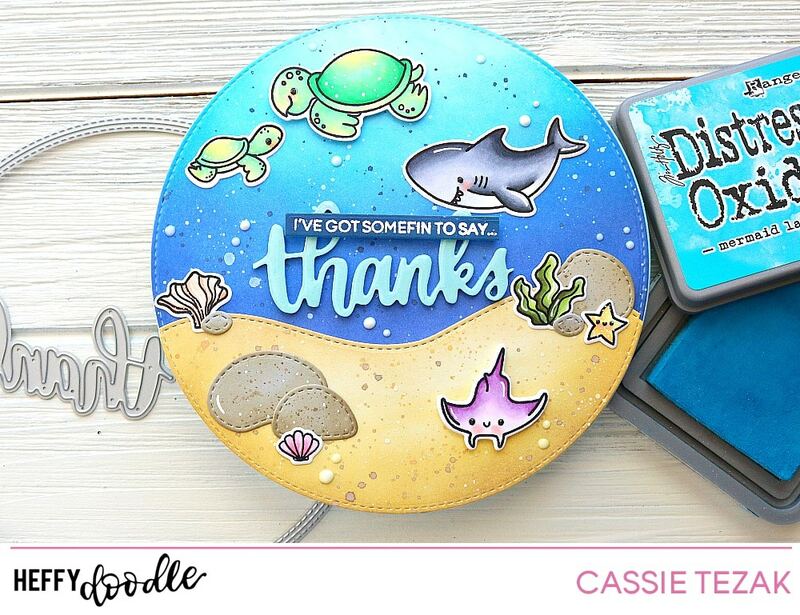 Next I stamped out all of the images from the Oceans of Love stamp set and colored them in with my Copic markers. I didn’t end up using every image that I colored, but the ones I didn’t use I just put in the stamp set sleeve for the next time I go to use that set! I added some white gel pen accents and die cut them out with the coordinating dies. Then I started arranging my scene! Once everything was laid out I adhere it all down with some glue. A couple of the images were popped up with foam tape. Next, I die cut four of the Thanks word die from a light blue card stock and adhered them together. I adhered that down to the center of the card, added some shimmer pen and glossy accents and let it dry. For the small strip sentiment, I heat embossed the stamp on some darker blue cardstock, die cut it with the Strips of Ease die, and popped it on with more foam adhesive. As a finishing touch I added some white Nuvo Drops around the card, and adhered another circle die with a folded flap to be my back/inside panel to the card. And that’s it for today! I hope you enjoyed the card I created. Do you make a lot of uniquely shaped cards? I love them, but I don’t do nearly enough! I appreciate you stopping by today, and I’ll see you again with another card! Hi, all! Can you believe we are a week away from Christmas?? I know I’m behind on sending out Christmas cards as well as Christmas shopping. Thankfully we still have a week to get caught up! Today, I’m sharing a card for Penguin Palace stamps that reminds me of one of my favorite holiday movies, The Polar Express. Let’s get started. Today’s card features some masking, ink blending and Copic coloring. I started by stamped all the pieces from the stamp set Love Train. I stamped the train tracks repeatedly towards the bottom of an A2 size card panel. Then I stamped the train and train cars on top of it. Next I did some masking and stamped the presents in the last car, as well as the puff of steam. The mountains were stamped last, and then I started working on the sky! I used my anti static tool and stamped the snow flakes from Cuddly Sheep’s Season’s Greetings and heat embossed white embossing powder over them. Then I ink blended some Tumbled Glass, Blueprint Sketch and Chipped Sapphire Distress Oxide ink in the sky area. I did cut out a small circle mask and place it in the upper right corner for the moon, but I didn’t worry about masking off the mountains, instead I was just careful as I got closer to them. The train and mountains were all colored in with my Copic markers. I used Scattered Straw Distress Oxide ink for the moon and later used a couple Copic markers to add some shading to it. At the bottom of the card, below the train tracks, I used a sloped stencil and my Tumbled Glass Distress Oxide ink to create snowy hills. Once all of that was done I added some white paint splatters over the enter card to look like snow. This also helps to hide any imperfections you may have. There were some spots where my coloring wasn’t perfect, but this distracts from that! To finish I heat embossed the sentiment “Merry Christmas” from the same set I used the snowflakes from on some black card stock and trimmed it down to adhere to the card with foam tape. I also added some white gel pen accents to the train. And that finished my card! I hope you enjoyed the card I made for today! I also hope if you’re scrambling to finish things up this week that you’re able to finish everything you need to! Thanks so much for stopping by today. I’ll see you again soon with another card! Hi all! Welcome back to Creatively Cass. 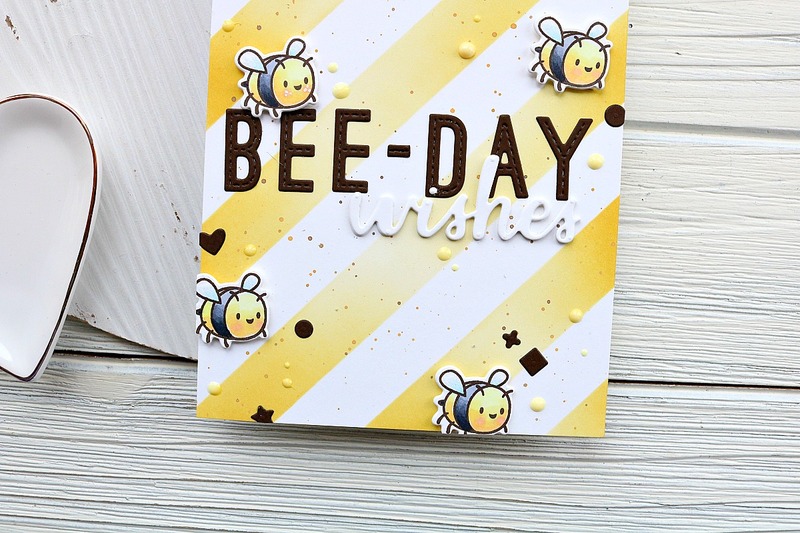 I’m here today to share a card I made for the Your Next Stamp feature day. This month our challenge was to mix and match at least two stamp sets for our project. 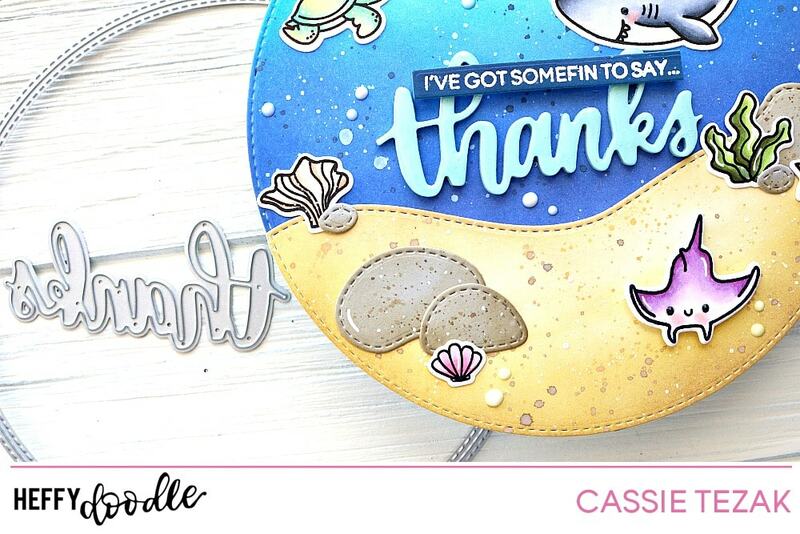 I love doing this, as I feel it really gives you the most out of your stamps and products, so this was a piece of cake! Here’s the card I came up with. I started by stamping the scale from Celebrate Sweetness on my card with some black ink. Then I took a heart stamp from the set and, by doing some masking, was able to fill it with colorful hearts. I colored all of this in with my Copic markers and used a white gel pen and glitter marker to add some details. Next I stamped the sentiment from Whatnot Sentiments Eleven with VersaMark and Heat embossed platinum embossing powder over top. At this point I wasn’t thrilled with my card, and wanted to bring in more color, so I grabbed some thin washi tape and did some masking. I used Picked Raspberry Distress Ink to add stripes to my background and spritzed water to give the splattered effect. I made sure to mask the hearts and scale so that no ink got on them though. And that is my card for today! I hope you enjoyed it. Do you mix and match stamps often? It’s something I love to do! Thanks so much for stopping by, and I’ll see you again soon with another card!